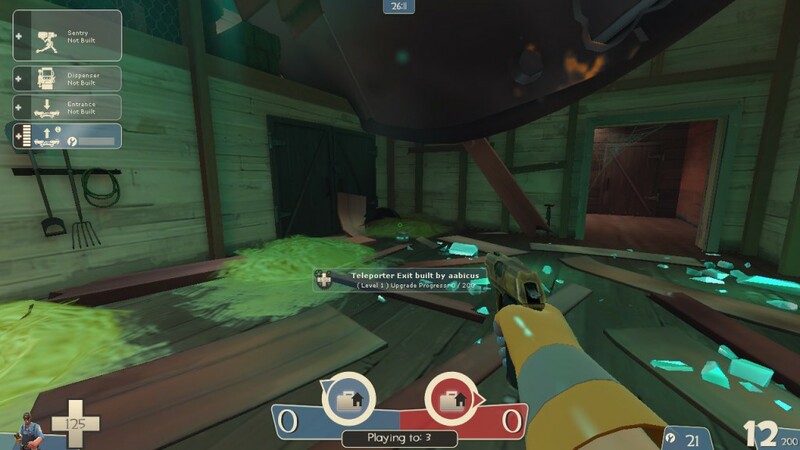 Welp, guess I’m eating my words, because 2fort_invasion turns out to actually be a pretty amazing map. For a reskin with no balance changes from one of the least-balanced maps in the whole game, Invasion does a great job of establishing its own niche through some absolutely beautiful artwork and set-pieces. The skybox is truly something to behold with the alien mothership hovering over the wreckage, tiny alien saucers occasionally docking and departing. 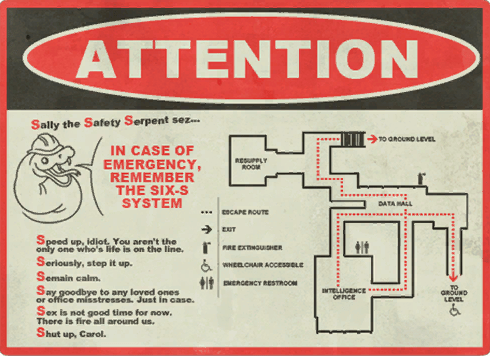 The state of the RED and BLU fortresses tells a story through tiny details like evacuation signs and warning posters. Now it’s not fair to say there were no gameplay changes, because there are alien orbs lying around that you can shoot and they explode, basically reskinned pumpkin bombs. But unlike most pumpkin bombs, two of them drastically alter gameplay in a huge but subtle way; it’s now possible for many more classes to explosive jump to either the bridge or the parapets. Not particularly practically, mind you; I haven’t managed to get Sniper to survive with anything above 7 hp, but Pyros and Heavies can make the jump with a pretty healthy chunk of their base health remaining. And in a game with medics, sometimes just having that explosive option is enough. All the debris also helps Engineers hide buildings, especially dead teleporter exits for Eureka Effect users. This is also a big day for 2fort fans with strange weapons, as we now have the closest thing we’ll ever get to a 2fort filter. Considering it’s one of the few maps that has a thriving community of players who exclusively play it, I suspect that this is the first strange filter that might actually see some dedicated use from people who want to show off their 2fort pride. But of course this silver lining must come with a cloud, and this time its the number of crashes caused by this map. Attempting to play it on low settings still kills your TF2, which is frustrating considering there have been three patches already since Invasion came out. It’s also causing problems in GMod, where visiting anything beyond the BLU side of the map is a one-way ticket to your desktop. Hopefully these problems get fixed soon eventually ever, because it’s a pretty great map and I’d love for everyone to be able to play it. Next Next post: My first time in a first-person shooter!